It was pitch black when I descended from Devils Garden Campground to Route 191. Rock formations, transformed over millions of years, stood silhouetted against a bruised horizon. Salt Valley Wash shimmered in the dark, as a silver crescent moon rested, cradled against the backdrop of her larger, darker self. Tower of Babel hovered ghost-like. I was the only person driving through the park at such an hour and alone my headlights held the grey road. 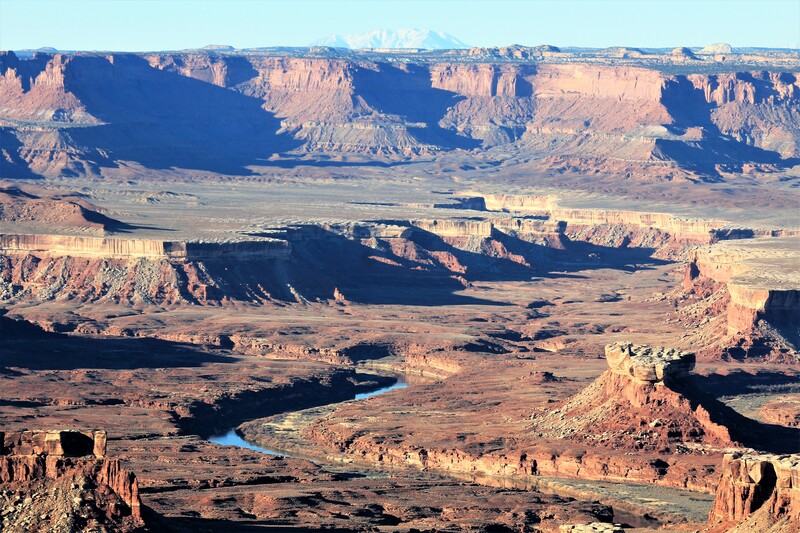 Route 313 dips south past Dead Horse Point, as white tips of the La Sal Mountains float in the distance. The night sky is a perfect deep sea blue – clear and smooth as glass. Stars leap in showy spectacle, each pleading their brightness to Hipparchus. The air is clean and crisp. The road travels a flat landscape, deep cuts in the earth hidden. Canyons carved by the Green and Colorado rivers sit in darkness only yards away. Minutes later I stand on the edge of White Point looking east toward a languidly rising sun. Waiting for daylight and a glimpse of islands in the sky. My headlights lit the entrance to Canyonlands. Just me and the coyotes. The sun creeps across canyons erasing purple. Behind every National Park are individuals that commit themselves to preserving and setting aside lands for the benefit of future generations. In 1962, thanks to the untiring efforts of Arches National Monument Superintendent Bates Wilson and Utah Senator Frank Moss, the U.S. Department of the Interior published a paper entitled ‘A Proposed Canyonlands National Park’. Here is a brief excerpt. “Rock — carved, colored and clothed by weather — controls the character of our land. Nowhere is the relationship between earth’s framework and the forces that shape it more dramatic than in the plateau and canyon country of the American Southwest.” On September 12, 1964, President Lyndon B. Johnson signed Public Law 88-590 establishing Canyonlands National Park. Canyonlands expanded to its current size of 337,598 acres on November 12, 1971. To all of those involved, we owe a debt of gratitude. Canyonlands National Park is made up of three districts – Needles, The Maze and Islands In The Sky – split by timeless wanderings of the Green and Colorado rivers. On this frost glazed morning I found myself standing at Grand View Point, looking southeast. A dazzling sun rose behind the La Sal Mountains and slowly crept over the orange sloping faces of wandering canyons. In the distance, buried deep in walls carved over centuries, rivers quietly go about their ceaseless work – sandstone layers softly hissing as they surrender to flowing water. It is a glorious morning and my coffee is till warm. I watched far too many westerns when I was growing up. Explains why the scraped tops of golden buttes always remind me of an elegant Indian headdress. Thanks Dad. Surrounded on three sides by rain hoarding mountains – La Sal, Henry and Abajos ranges – flat topped islands remain sparsely treed. Indian ricegrass flourishes, along with ever-present junipers, their blue winter gripped berries waiting for spring. Hawks glide above the rim, riding the wind, dipping down into the tiered amphitheaters, effortlessly changing the angle of their wings. Ravens, midnight in color, walk along the canyon’s edge in search of food. Deep below, desert bighorn sheep climb the rocky outcrops of Upheaval Dome. Concavely shaped by a meteor long before man, not rising as its name suggests. Perhaps an older brother of the more famous Meteor Crater near Winslow, Arizona, it rests over 1,500 feet below the rim – brown and black concentric rings laced with burnt orange. Near the northern entrance to the park, the road runs along a narrow, high stone mesa called The Neck. A ribbon of stone separating the deep jumbled rimlands of Taylor Canyon to the west and Schafer Canyon to the east. As I stand above Schafer Canyon Road, I immediately understand why it is listed on DangerousRoads.org. They describe it rather well. “This road has humbled many egos. It’s not for the sissies and shouldn’t be attempted by novice drivers. The road is in dreadful condition and requires strong nerves to negotiate it. It’s certainly breathtaking and it has a fearsome reputation. It still remains an adrenaline-pumping journey and is definitely not for the faint of lungs, heart, or legs. Words can’t describe the road and pictures don’t do it justice.” It is a perfect assessment of what lays below the rim of where I stand. Fortunately, my eyes do it justice. I decided to walk. A month or so after this photo, I met a couple in Black Canyon of the Gunnison who actually drove a portion of Schafer Canyon Road. Hello Wisconsin! Hi Meg and Ray. You guys are nuts. Schafer Canyon Road near the bottom where it flattens out before plunging again. The pumpkin colored road spreads out below, a series of switchbacks and hairpin turns, plunging into 1,500 foot walled canyons. It reminds me of Grand Canyon’s, Bright Angel Trail, except here the descending switchbacks are wider, more sweeping. Within a half mile I congratulate myself for not attempting in the van. Large rocks and uneven cracks line the road. In most places it is barely wide enough for a single vehicle. Any slight mistake would take you over the edge. This is a road seldom tested. I can also see ahead for what seems like miles and there isn’t a vehicle – or human – in sight. I ventured down for only a mile or so, acutely aware that my climb back to the top was going to be brutal. Arriving back at the top, winded ad questioning my sanity, I sat for a while hoping to see someone on the road. Not a chance. Islands in the Sky and Needles are separated by about a two hour drive. There are no roads across the park, so you have to backtrack through Moab and pick up Route 191 south. Minutes after turning onto the rollercoaster-like road to a Needles overlook, signs caution ‘Open Range’, accompanied by the black outline of a cow. A mile or so up the road I quickly learned the meaning of open range. In a nutshell, cows can stand in the middle of the road and stare at you as if you had just branded their daughter. It means they can gather in groups just over the top of a rise so that you have to take two years off the life of your brakes in order to stop, before scattering like chubby bowling pins. It means they just don’t give a damn. I stopped the van – got out and offered this fine looking lady a bib. She gave me her phone number. 876-5309. I know you’re thinking the same thing. In every national park there are clearly marked observation points. Many times just a few steps from a turnout on a winding road leading through the park. In some instances you can actually see a sweeping vista, blue canyon or landscapes frozen in time without leaving your vehicle (cheating). Others are a short distance from a trailhead. These points are always protected by metal or wooden barriers for safety. Beige paint rubbed shiny smooth, wood grayed with time – the former inevitably bent from the weight of thousands. In each case, the viewing area is a protected island. A semi-circle where even the squeamish can stare into the abyss. Canyonlands is home to many overlooks. Scattered among the thousands of square miles of crumbling sandstone ledges and sheer cliffs. Hidden beyond the scratchy low slung bushes and yellowed grass, they stand patiently waiting for another hand to move along their cool protective railing. To confidently lean back against decades old metal driven into rock, capturing a barrier free photo. Then there is the area only a a few feet to either side – a small step outside the protective island – the other 99.9% of the park. This is the area I often find myself in. Not because I’m foolish or brave. I’m neither. But because a few feet to the left or right can be the difference between exceptional and majestic. Or beautiful and stunning. Sometimes a few feet make all the difference. Brown rivulets fold the land as it falls into the canyons. A morning sky of white into pink into blue. The thin line of a road to the right of the canyons lend perspective to their depth. Mountains hovering above a green dotted landscape. There it is again…in the background…I know you see it. Serpentine carvings into the brown chalky plateau. Promenade overlooking Schafer Canyon. No railings. This man has been following me for months. If anything happens to me…. NOTE: For more information on Canyonlands National Park and all the National Parks and to help with trip planning, download the free Chimani app to your smart phone to easily navigate your way around the park, with or without cell phone service.